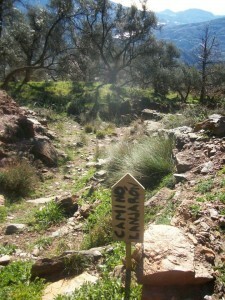 Finca Montaña, a great base for your walking holiday in the Alpujarra and Sierra Nevada. Finca Montaña, our Mountain House, is a reasonably priced, base for walkers to enjoy the spectacular hill and mountain walking that the Alpujarra and Sierra Nevada have to offer. The Alpujarra is an area on the southern slopes of the Sierra Nevada Mountains. The area is characterized by steep vegetated valleys, terraced with almonds, olives and chestnuts with pretty white villages clinging onto the hillsides, a legacy of the Moors (Arabs) who ruled here for centuries. It was the Moors (mainly Berbers from North Africa) who set about cultivating this area and created the watering system known as Acequias that are still in use today. The Sierra Nevada mountains that rise above the Alpujarra became Spain’s first National Park. Here the wildlife is truly amazing and during the summer months you’d be unlucky not to see eagles, vultures and Ibex whilst out walking. The plant life is stunning too with around sixty species endemic to the Sierra Nevada. Finca Montaña is in a remote peaceful location situated at an altitude of 1300m. It is a 5 acre small holding given over mainly to almonds and chestnuts with some soft fruit and vegetables too. From this lofty height there are spectacular views southward to the Sierra de Lujar, the coast at Salobrena and on a clear day the mountains of North Africa. It is possible to while away time soaking up the views, observing the wildlife and going for short strolls in the vicinity. Finca Montaña is not a swish up market property, it is a traditional mountain farm, think of it more as a mountain Refuge for walkers! To get to Finca Montaña it is a 12Km drive up a rough dirt track road and after a hard days walking you’d probably not want to be faced with an excursion to the bars of Lanjaron. 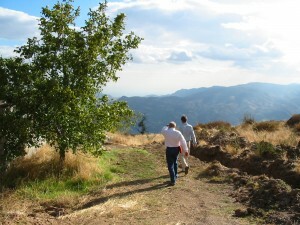 Mike and Jane the owners of Finca Montaña are keen hill walkers themselves and are qualified guides. As such they understand that people arriving in an area for the first time don’t want to waste time on mediocre walks and have compiled a list of route information that is available to guests in the form of route cards. Some of these are available as downloads in advance of your stay. Mike and Jane through their company Sierra Nevada Guides often have a programme of guided walks running in both the Alpujarra and Sierra Nevada and as qualified International Mountain Leaders may be hired to guide you to climb a range of the peaks in the high Sierra Nevada or lovely trails lower down. There are a range of good walks to be had straight out from Finca Montaña. Though we would not advocate spending a whole week walking from the house, it is certainly an option to use Finca Montaña as a base with a mixture of walking in the area. Itineraries not to be missed include: a circuit in the Poqueira Gorge visiting the pretty villages of Pampaneira, Capileira and Bubion and a circuit in the Taha valley and possibly a visit to the Poqueira Refuge at 2500m. Details of these walks ate available as downloads from the Sierra Nevada Guides website. The GR 240 “The Sendero Sulayr” Spain’s longest circular long distance footpath passes close to Finca Montaña and we would be happy to support you on this. The Highest Mountain in Mainland Spain. Sierra Nevada Guides have written a guide to routes on Mulhacen, which is available to download. Third highest in the Sierra Nevada and possible as a day trip in the summer months by using the National Park’s bus to Mirador Trevelez. Alcazaba is the most remote and most difficult of the big three mountains in the Sierra Nevada. Second highest mountain in the Sierra Nevada, and a relatively easy peak from Hoya da la Mora near the ski resort. Europe’s most westerly 3000m peak and we think the best day out in the Sierra Nevada! A less visited but enjoyable peak. 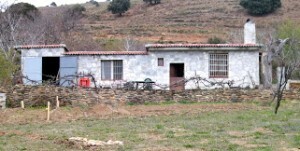 Finca Montaña is a remote mountain farm and the accommodation and prices reflect this. Reached by 12km of dirt track road (for those driving). The rewards for being so high and remote are the stunning views, quiet solitude and the typical Spanish way of hill farming with the local goat herd wandering by most days. We have 2 bedrooms available in the “new house” a double and a small double. The property can accommodate up to 4 adults and 1 child (top bunk above the double). There is a shared washroom with shower, w.c. and hand basin and a shared living room / kitchen. Outside is a patio with views down to the coast and occasionally the mountains of North Africa. This is a 12 volt house. We generate our own power from a solar panel and wind turbine. The power is stored in batteries so if guests leave the lights on the batteries will run flat! All rooms have lighting and bedside lights, there is an ipod dock and a means of charging mobile telephones (car socket, bring car charger for your phone). The fridge and freezer like the cooking and water heater all work off gas. We have springs on the land to collect our own water and we have a septic tank for the drainage. Because the house is so remote, it is unlikely that you’ll want to drive down the mountain into town for a beer in the evening. However the house has sitting areas outside where you can soak up the views as the sun sets with a drink in hand to unwind after a days walking. We keep the fridge well stocked with beer and wine, which guests can help themselves to and settle up at the end of the stay. Once night arrives the clear skies are superb and it is a joy to sit out enjoying the stars, especially in the height of summer when this time of day is cool and a relief from the heat. In the cooler months the evening and night temperatures can be quite cool at this altitude. Fortunately we have a large open fire and an endless supply of logs! 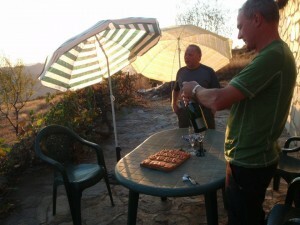 Bed and Breakfast at Finca Montaña = 20 Euro’s per night. To make the most of your visit to the Alpujarra / Sierra Nevada, we recommend you hire a car. (A small van is best as this gives better ground clearance on the dirt track roads used to access some of the walks – Berlingo, Doblo, etc.). It is possible to visit the area using public transport but not all of the walks will be easily accessible. We can arrange airport pickups from Malaga Airport from 80 Euro’s.